The apartment his situated in a 19th-century building, in the centre of old Krakow, mere 100 metres from the Main Square, one of the largest and the most beautiful European plazas. A two-minute stroll along Mikołajska Street brings you to the splendid Small Square surrounded by mediaeval houses, then past the magnificent basilica of Virgin Mary to the Main Square, the hub of city life. In its immediate vicinity, there are numerous landmarks and museums, as well as a wealth of cafés, restaurants, bars and pubs offering Polish and international cuisine. Despite its location in the centre of Krakow, this third-floor, architect-designed apartment offers peace and quiet with its windows and TERRACE overlooking the inner yard. 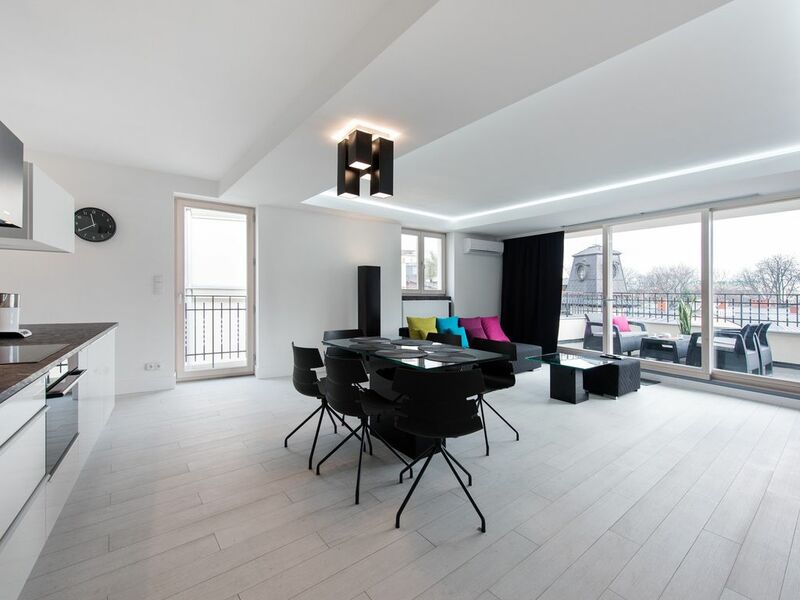 The apartment consists of three rooms, open-plan kitchen and two bathrooms. Each of the well-lit spacious rooms has a separate entrance from the hall. The apartment features three bedrooms (double bed, double bed, 2 single beds). Each bedroom is furnished with a spacious wardrobe for all your travel necessities. The sparkling new bathrooms include a shower (bath + bidet in the 2nd bathroom), generously sized washbasins, heated towel-rail. Big mirrors on the main wall enhance the feeling of space. Fully equipped open-plan kitchen is equipped with a ceramic hob, refrigerator, microwave + oven, coffee maker, toaster and other utensils. A washing machine and an iron are available as well. Exceptional location combined with stylish design make this a superb value option for a short or long stay in Krakow. Great location to enjoy the square , easy entry, taxis nearby if needed. Rooms are large with interesting roof lines. Only bad thing was someone renovating an apt next door started at 6am. Highly recommend this apartment while staying in Krakow. Great property in an excellent location for the main square . Steps in the apartment could do with marking but otherwise the 6 of us across 3 generations had a great time . Would thoroughly recommend . Owner even sorted taxi transfer from the airport for us . We were unfortunately led to the wrong property when we arrived because of a mix up with the booking. however, this was quickly sorted out and we were left to enjoy a fully equipped, modern and comfortable property with all the amenities you will need for a successful break in Krakow. The only criticism I have is there is only one shower for three double bedrooms, but there is also a bath with a shower attachment. Although we were there at the beginning of winter, I would say a major bonus for the summer months is an excellent and roomy balcony terrace. This was our first time in Krakow and it didn't disappoint. We were a party of 6 and I was responsible for booking the accommodation. I was a little apprehensive as you never know if the picture and description on the website are a true reflection of the apartment. Well, it wasn't, the pictures do not do this apartment justice it was clean, modern and very spacious - definitely had the wow factor. As a party of 6 adults, we didn't feel on top of each other, we had our own space and the ability to sit together in the living area. The facilities were perfect, the lift did work but was a little temperamental but only when going down so not an issue. If I had a comment about the facilities the only comment we had was there were no bath mats - but this is a very very minor point and did not take away from what is a very well equipped apartment- it had everything you could need from clothes maiden to coffee machine to iron & board to hairdryers there was nothing we could have asked for. The location of the apartment was perfect, 5 minutes stroll and we were either in the main square or in the park. Araceli was amazing from booking to checking out. He arranged our transfers and trips. He met us at the apartment on arrival and walked us through the facilities. He gave us advice on what to see and where to get the best value. He gave us his contact details and was very responsive and helpful. The accommodation made our trip extra special, somewhere we could all be together comfortably, amazing facilities and in the very best location. We will be returning to Krakow and will most definitely return to this apartment.